PC #126 – Why do it again? Why does anyone walk the Camino a second or third time? Or more? Why put yourself through that hardship and pain? I ask myself this question, because yesterday I went for a 5km walk with the aid of a very expensive knee brace, and now I'm starting to think about getting my fitness back so that I can walk the Camino again. I'd be fascinated to throw this out to you blogees – why have you, or would you, walk the Camino a second time, or multiple times? Is it the cameraderie? The friendships you form? The challenge? The joy of walking and exploring a foreign country? Is it the food and wine? Is it the uncertainty of your experience that's exhilarating? That you're unsure if you'll make it, or if you'll get a bed each night, or if you'll come down sick or injured? Or is it something deeper, more profound? Are you seeking a spiritual experience? A religious experience? Are you looking for answers? Are you hoping the Camino will sort out a particular problem? It's easy to say: All of the above. But if you had to give one reason why you'd walk the Camino again, what would it be? After you've told me yours, I'll tell you mine! It just calls, its in my head, every day, it has to be fed. But it would be a mistake to walk the next Camino Frances trying to re live the last one. Different people, different conditions and most probably a different person than last time. This is so true Pat. You can never try to recreate past experiences. That I think would be one of the great things about doing a second, or multiple Caminos – it would be the same in some ways, but so completely different in so many other ways. I see photos from Peter and Anne and Arlene as they post on their blogs as they go, and I look at the stretches of road or track that they photograph, and I think: Huh, I walked that stretch, but it looked nothing like that photo. It was green and now it’s brown, or it was early morning and in the shot it’s midday. Or, there was no-one on that stretch when I walked it, but in that shot there are dozens of people. So different, yet the same. Ditto, it calls, it’s in my head, soul and heart. Last Fall I started for myself and ended up fulfilling an ancient quest. This time, might be just for myself. I wont walk the entire CF again – that would be somewhat traumatic. It’s the same reason that I haven’t listen to all of my voice recordings yet. As it is, I am following Arlene and Anne and another friend Manon and soon Julie. I am having flashbacks and wish I could be walking now. That’s wonderful Ingrid that you’ll be doing some hospitaleros duties! Good for you. That should give you a whole new perspective on the Camino. But I’m curious – why don’t you want to listen to some of the recordings you made? I can see the pictures so clearly from your poetry. And I can see why you may not want to revisit some of those recordings. So of course as I re-read my entry with the poem, I noticed that I got my timelines mixed up. The Meseta of course one walks well before Cruz de Ferro. It just shows you, even a year later, that part of my Camino still haunts me, it was of course a precursor of what was going to happened 2 day hence, Sept. 28, when my Camino changed in a way I could not have ever imagined. So my apologies – if any of you are like my husband, who can’t abide inconsistencies. I put it down to poetic license Ingrid! Because while one’s legs walk, the mind and spirit are navigating a vast interior sea. The walk was finished before the self found its true home port. That’s very true Brendan, and so elegantly put. One major reason for me is to try and manage my weight back down to something approaching normality ; long-distance hiking being the only sports activity that I actually love. Another major reason is that I sometimes need to return back to the source, in this world anyway, of my conversion from agnosticism to Christianity, and then to the Catholic Faith. And then I usually have some extra reasons for each pilgrimage, and my main 2014 extra reason is to try and get my muscles back into shape ; see above. I need to be back on the Camino two or three times a year just because I feel good with no walls around me, with nothing that stop the eyes , no watch to tell you that you have to eat, , no obligations to stick with people you do not like,, always moving, like the blood in our arteries, like Life. less distraction, more freedom to be yourself. The camino makes me happy. . But 2 or 3 a year? Wow. That’s not possible for us in Australia. It’s such a long way to go! As I read your post this morning two words jumped into my mind – “pilgrim soul”. These words were given to me as part of a beautiful inscription by Ailsa Piper in my copy of her book “Sinning Across Spain”. Several of us from Pilgrims in Sydney attended a book talk given by Ailsa and Monsignor Tony Doherty last night at Thirroul Library – thanks so much to Norelle who let us all know that it was happening. These two words have me wondering if everyone who walks the Camino could be offered a “spiritual sellos” which could be stamped on their soul, that states they are now a “pilgrim soul” – you can either accept it or pass on it. If you accept it you might also have to accept that the Camino is going to play an increasingly larger part in your life; that allowances are going to have to be made in other areas of your life so you can accommodate your growing love of the Camino. You might also need to accept that you will want to be back on the Camino as soon as you can possibly work it. I have that stamp and it’s very clear! That’s why I’m heading back next year! 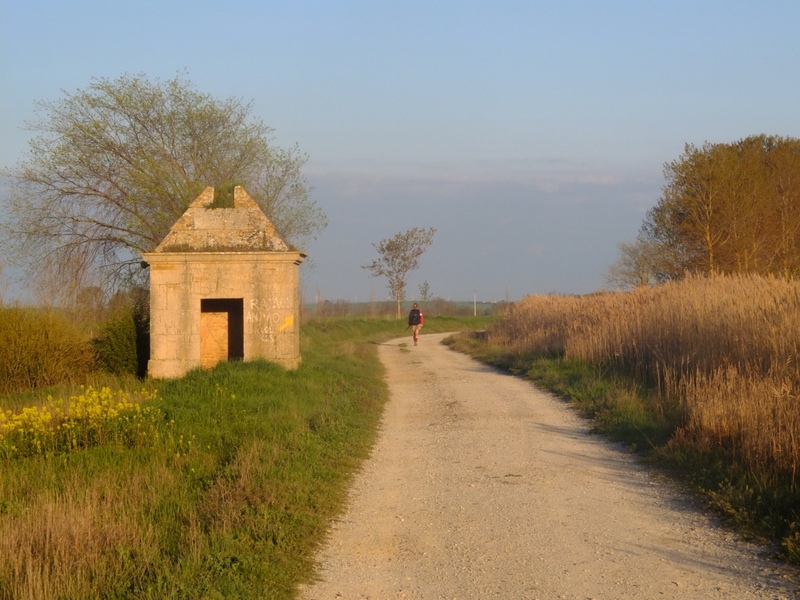 I wonder� are there many people who walk the Camino who AREN’T similarly affected? Perhaps we just live in a tightly knit community that share similar sensibilities when it comes to the Camino – but I wonder if there are some people who walk the Camino who just chalk it up to a grand adventure, or a physical achievement, and then don’t think much of it afterwards. The way you are affected, the way I’m affected, and Britta and Janet and others on this blog – is that the natural order of things? Or are we the cranks and oddballs? I think that the Camino affects the majority of people who walk/cycle/experience it. Those who aren’t affected by it seem to be in the minority and they will still have their Camino memories – great memories – but the Camino doesn’t stay with them in the same way as it does with those who have been affected. The way all of us on this blog are affected IS just as it should be in the natural order of things! I can only speak for myself but I firmly believe “odd” is the new “cool”! Cranks and oddballs unite, and hey, we’ve already done it! haha – I feel good in the company of other cranks and oddballs!! my soul regarding the Camino that i hear many on here express. I dont think it “has” me. I found it a wonderful adventure and one that i would repeat, but not because i “have” to. Sure, I opened my heart and soul to the Camino and would again, but if by chance i mever return that will not be a disapppontment. I think Camino thoughts when i follow the blog but not otherwise. But if i wall ahain, i will do so with an open heart and mind. I try to do that with all life’s experiences since learning it is all beyond my control. In my experience, I’d have to say though, there seem to be two broad types of “repeat pilgrims” ; those who repeat the Camino because they seem unable or unwilling to leave it ; and those who repeat the Camino for completely different reasons. I’m definitely in the second group, and every time I’ve finished a pilgrimage, except for my first fairly botched Camino in 1993, it has been with a very definite sensation of “OK, I’m done”. I simply could not return to the Camino without a new reason to do so, and a new motivation, for a new pilgrimage — excepting my above-given reason for wanting to do so partially as a sports activity. I am of course aware that there are a certain number of pilgrims who become as if “stuck” somewhere on the Camino, and hence have a constant urge to return there — and hmmmm, if I were to live right next to the Pyrenees, I’m sure I’d feel that same temptation myself to at least some extent. Which is why it”s so interesting to hear the thoughts of those with this “compulsion” that I do not share ; the Camino really only plays a actively large part in my life when I start to have reasons to return there — notwithstanding the massive effect in my life that the Camino has had, generally ; but when I’m done with the Camino, my focus shifts quite radically back to home in a very swift manner. Jenny says : “You might also need to accept that you will want to be back on the Camino as soon as you can possibly work it.” — but I do not feel like that in the slightest. Possibly there’s a difference between those seeing the Camino as a means to a different end ; and those seeing the Camino as an end in itself ? Well Julian once again you raise interesting points. I get the sense from some pilgrims on other forums that the Camino has become a means whereby they define themselves. Not in a spiritual sense, but in an ego sense. Your notion of needing to have a “need” is really worth considering. Surely that would have been the case in times past – people would have done a pilgrimage only for a particular spiritual or religious need. And I wonder why pilgrims don’t tootle off to other pilgrimages – such as Jerusalem? Or Rome? Some do, I know. But the Camino de Santiago seems to have a very powerful pull. Thank you all for sharing your thoughts – they’ve all given me a lot to contemplate on. Over the last 16 months since I returned home from the Camino (who’s counting!) I’ve often pondered why the Camino had such a big effect on me – why it’s so different to other special places in the world – places that I hold dear in my heart. For me, it was the setting out on paths I knew to be ancient and sacred, to experience the history and the mystery of The Way, and the sheer magic of spending time with pilgrims from across the globe – all heading to Santiago. The privilege of being on a pilgrimage with thousands of others. I’d never experienced anything like this before in my life and it was a really big thing for me. I took the wonder of all of this on board and it’s stayed with me and grown as I’ve carried out research, read many memoirs, joined Ivar’s Forum and of course becoming part of the PGS family. These are the reasons I’ll be back next year. what a thoughtful and well expressed response. you put it all so beautifully. When you next walk the Camino, you will take that respect with you, and it will enrich your next experience, and I dare say will enrich those you come in contact with too. Thanks so much Bill – I really appreciate your thoughts. ‘Can’t wait until next year – particularly when I’m at Rabanal volunteering … you never know who is going to walk through the door … no two days will be the same, that’s for sure. I’m hoping that Ingrid and I will be able to swap stories – Ingrid is going to be AWESOME as an hospitalera! Personally, I wouldn’t do the Jerusalem one though ; 77 days from here to Santiago (plus the 10+ days return trip and a couple of days rest/celebration at that end) was about the maximum limit of what I can put up with. It’s great to hear others are going wider than the Camino Frances. Hi Ingrid – thanks so much for your beautiful thoughts. I love that a friend asked the Camino to take care of you. Adventure! Spontaneity! Self-reliance! Trust in strangers! Ice cold beer at 11 o’clock in the morning!! Hi Ingrid – an ice-cold beer sounds great! Pilgrims’ petrol I’d say! I never drink beer but I did have some beer on my camino. It was my writers aide will I wrote my blog!! I’m usually a beer person, but I switch to wine on the Camino — it’s a richer drink, and it’s a better pain-relief drink, provides more vitamins, and it is far more useful for better sleep and impassiveness about snoring than beer !!! I typically carry a small half-litre of wine in a plastic screw-top bottle on the Camino, and drink small sips from it during the day’s walking. I should do that walking around Mudgee! Hi Ingrid – I’ll be at Refugio Gaucelmo from 30 June to 16 July next year. I agree with you about the manners of some of the hospitaleros there … one of the members from our Pilgrims in Sydney group (BTW he is 81) was ill when walking from Astorga to Rabanal earlier this year so he had his pack transported. He struggled through the day and when he eventually arrived at Gaucelmo he was turned away as he had had his pack transported. No compassion shown for his circumstances. This is something I’m going to raise at the Training Day in February in London. If a pilgrim has a valid (ie medical) reason why they cannot walk with their pack they should be welcomed and given support by the hospitaleros, not turned away. I know that you had a similar incident there. The proper afternoon tea would be so fabulous! I am already getting together a small selection of recipes for afternoon tea – scones, banana and lemon pikelets etc – all made from readily available ingredients. Your tea ceremony would be so special! Why not apply to the Confraternity of St James and see if you can put your name down for a cancellation spot – you never know, one of the other hospitaleros may cancel and you can join Julie and me! We would LOVE that! I’m sorry to hear that you won’t be able to take up the volunteership at the end of October; it would have been great then … autumn would be well established and you would have the joy of seeing all the leaves falling with their stunning colours. I’ve been told that cancellations happen from time to time, as the dates usually run at least a year in advance, and obviously circumstances can change for some proposed volunteers. If you do place yourself on a cancellation list you might find that it has proven to be the ideal time in every way. I hope very much that it works out for you in the way you wish. Thanks so that info, I would have to agree with that theory! Like you Bill, beer has tended to make me tired with heavy gams, another reason to have avoided it. But, not on the Camino! I was raring to go. And, yes Steve, it didn’t do anything for you as you said, however as a non drinking man, it was great seeing you have Vino Tinto everyday. The Camino allows you to eat and drink things you wouldn’t ordinarily, under other circumstances. For instance, for a lot of the journey I had a block of chocolate with me, which I’d munch on from time to time. I never do that! Hi Bill – chocolate or trail mix ? Chocolate, chocolate, chocolate !!! I didn’t spend enough time in Astorga. I would like to take Jen back there and really explore the place – and the chocolate shops!! Hear Hear! Britta, Janet and I can all confess to falling in love with the dark chocolate slabs filled with almonds from Astorga, the chocolate capital of Spain … why do you think I’m volunteering at Rabanal? It’s close to Astorga – and those chocolate shops !!! It’s true about foods on the Camino but unlike you who lost weight , I gained weight and it made the trip all that much more difficult. I ate my Kit Kats almost every day and so enjoyed the flavor but I have learned that my body really doesn’t do well with sugar or chocolate, let alone milk, cheese, pork, white bread or sadly Tinto vino ! So my next Camino will consist of foods with higher vibrations that will further allow me to connect with the spiritual energy that exists along the way. I realize now that that is why my trip was disconnected. I shut myself down with the good and it didn’t serve me well. Great lesson as it turns out! !